This map shows the locations of the Human Dignity and Humiliation Studies Conferences until 2017 - please click on the map to see it larger. If you wish to particpate in our future events, please email us! Since 2003, we have had two annual conferences, one in December in New York City, and the other outside of the U.S.A., always at different places and at varying times during the year. Each conference has had a very distinct flavor. So far, our NY Workshops on Transforming Humiliation and Violent Conflict have been larger (65 participants), more formal and structured, as well as more outward oriented than our outside-of-the U.S. conferences, which have been smaller (15-25 participants), more open, informal, and more geared toward weaving our network closer together within.  Dignilogue Tips and Dynamic Dignilogue List, created on October 10, 2015, for the 2015 Workshop on Transforming Humiliation and Violent Conflict, in New York City, December 3 – 4, 2015. Our appreciative frame is an adapted version of Appreciative Inquiry (AI). We believe in "waging good conflict" (Jean Baker Miller). Since diversity enriches, we think that diverging opinions and perspectives need to be expressed rather than avoided. However, diversity only enriches if embedded into mutual connection and appreciation. If not harnessed lovingly and caringly, diversity has the potential to humiliate, divide, create hostility, foster hatred, and even violence. In the spirit of our vision, we as the HumanDHS network, wish therefore to avoid the latter, and instead open space for common ground and mutually caring connections, a space for the safe expression of even the deepest differences and disagreements, and the toughest issues of humiliation, trauma, and injustice. Please see also our Appreciative Enquiry page and, to get a taste, watch this little film called Validation.  Please see also Relationship Tips developed by Judith Jordan, and Linda Hartling, at the Jean Baker Miller Training Institute, 2006.  Please read An Appreciative Frame: Beginning a Dialogue on Human Dignity and Humiliation, that Linda Hartling has written for us in 2005.  Please see also Appreciative Facilitation: Hints for Round Table Moderators, kindly written in February 2006 by Judith Thompson to support the moderators of our workshops.  Please see also Toward Communicative Virtuosity: A Meditation on Modernity and Other Forms of Communication, written by W. Barnett Pearce, Santa Barbara, CA: School of Human and Organization Development, Fielding Graduate University. Paper presented to the seminar "Modernity as a Communication Process (Is Modernity "on time? ")," April 15, 2005, Department of Communications and Social and Political Theories, Russian State University for Humanities Moscow, Russia 103012.  Please see also Bykr, A. S. and B. Schneider (2002). Trust in Schools: A Core Resource for Improvement. New York City, Russell Sage Foundation. Please see the notes that Linda made on this book.  Please see also the discussion of communal sharing (CS) versus equality matching (EM), by Finn Tschudi: Reflections on World Parliament Experiment, WPE, at isfit 2007. The term "Appreciative Inquiry" and the approach to organizational consulting and inquiry was developed by David Cooperrider at Case Western Reserve University. The approach is gaining wide usage among people doing organizational consulting. My work overlaps with David's approach. I am using the term "Appreciative Being" to describe a way of relating to life events via our human inherent capacity for experiencing awe and wonderment at being part of the universe. The Jean Baker Miller Training Institute recently hosted a conference about Creating Relational Possibilities, with its last session about Holding a Vision of Hope. I think that both headings are also important for our group and our conferences. We are not motivated by financial rewards or by wanting to have a job. Our motivation is provided by our values and goals and the enthusiasm and hope we can create in our group. We want to contribute to building "a better world" and this is what drives us. Thus, the inner cohesion of our group must be our priority, otherwise none of our activities will have any grounding and we will fail. This is, incidentally, also the cutting edge guideline in corporate sector consultancy ("hire for attitude, not for skill!" Kjell A. Nordström, Stockholm). In other words, it applies even to ordinary companies that need to make profit. Therefore, nurturing the relationships among ourselves, caring for each other, keeping our spirits up, must be the object of our primary attention. This entails many details. Whoever holds a job for financial rewards and finds broader meaning not within, but outside the job, easily develops a host of attitudes and behaviours that might be damaging to our group, if displayed there. Many companies are afflicted, for example, by fragmentation. Out of frustration, employees may be tempted to try building alternative power bases for themselves among their collegues by blackening others ("don't tell X that I think that X is wrong in doing x, y, z..."). We have to guard against this kind of fragmentation. Or, perceived failings and disappointments among colleagues often lead to rifts ("take me off her team"); in our group such disappointments require that we all engage in healing activities. Deutsch's Crude Law of Social Relations is central as well, which indicates, in short, that "cooperation breeds cooperation, while competition breeds competition" (Morton Deutsch, 1973, p. 367). Long is the list of new relational skills which we need to learn in order to build a cohesive group of mutual enrichment, which only then can contribute to building "a better world." Appreciative Inquity, Appreciative Being, and Appreciative Caring, all three need to be combined so as to achieve social relationships of equal dignity (that are void of humiliation), which in turn enable us to do constructive work in and for the wider world. Please see here Buddhist Teachings on Right Speech, that relate to our quest for appreciative enquiry, caring and being. Please see also Is it Possible to "Change the World"? Some Guidelines to How We Can Build a More Decent and Dignified World Effectively: The Case of Dignifying Abusers, by Lindner, 2006. Noel Mordana is currently creating an academic paper that is based on this text, to be submitted to our new journal. Many have expressed interest in this text, so, perhaps we can treat Noel's version as one product, and the organic growth of the attached paper as a separate project?! Appreciative Nurturing (AN), a text in the process of being written collectively. Please let us insert some reflections on the problem of travel to our conferences and global warming. During a presentation at our 2007 conference in Hangzhou, China, environmentalist Keitaro Morita, pointed out how many “environmental” and “progressive” organizations do not “walk the talk” of environmentalism, and how participation in international conferences contributes to the problem of global warming. We, the HumanDHS network, promote the vision that all global citizens ought to recognize their joint responsibility for their human family and its biosphere. We hold one conference a year in a different part of the world so as to make it more accessible to members from all regions to meet each other, and make great efforts for people from developed and developing parts of the world to interact. We realize that travel to these activities also to global warming. As meeting face-to-face is an important part of building our global network, we think we should continue to hold our conferences while supporting alternative fuel technologies and lobbying the world's decision makers and engineers to leave the outdated technology of burning fossil fuels behind. We would also ask those interested to support or become involved in one of the environmental groups we recommend on World Environment for Equal Dignity Project. We are constantly attempting to build and improve digital interconnectedness of our network. Any ideas or other contributions you have to help us improve these efforts is greatly welcome and appreciated. 1. We attempt to build digital ways of meeting so that the need for travel is lessened. 2. Many of our participants do not come from the wealthy parts of the world, and adding to their sense of exclusion through forbidding them to come to our conferences, would easily amount to humiliation. 3. Conversely, we would like to encourage people from the wealthier parts of the world to engage with the rest actively and in person, so as to be better prepared to address the suffering of millions. 4. We, the HumanDHS network, wish to promote dignity and transcend humiliation, among others by promoting the vision that all global citizens ought to recognize their joint responsibility for their human family and its biosphere. Meeting face-to-face, at least once in a while, is an important part of building a global human family. Instead of cutting down on something that is important for building a global family, namely to meet, we think we should rather work for increasing efforts to press the world's decision makers and engineers to do something that is long overdue, namely to leave outdated technologies behind (see links to organizations that merit support, for example, on our World Environment for Equal Dignity page).  "Living Globally: Global Citizenship of Care as Personal Practice," is the long version of Lindner's contribution to the anthology Norwegian Citizen - Global Citizen, 2013: It starts as follows: "I admit, I am a pioneer, almost too far ahead of my time—I have not yet met another person who intentionally develops a global life design like me. Yet, I am sure that many more people would derive great joy from trying my path. Sadly, I see how many who are in a position to be more daring stop at ‘straw man’ arguments. The ecological footprint of global citizenship, for instance, does not have to be large: I move about our planet slowly, since forty years, not just by plane but by foot, bus, ship, and train; I know the desert on horse, donkey, and camel; I have even trained to build and fly simple gliders and small motor planes. To be sure, one of the tasks of global citizenship is to globalise the insight that the burning of fossil fuel is outdated and irresponsible and has to be replaced by more intelligent solutions—and that burning biofuel from urgently needed food is even worse." Please read an essay that Michael Britton wrote in response to the dialogue between Evelin Lindner and Neil Ryan had on the challenge of finding the "right" moral tone in formulating a statement for our website in response to a writer's email noting that our annual conferences involve air travel: Doesn't that involve us in activity that works counter to concerns about climate change? What should the Network's statement on the subject be? I was delighted by the invitation to comment on their joint writing endeavor. How could I not find the issues they so elegantly raised both fascinating and illuminating? I found myself imagining a different kind of conference in which we would do art together, and/or movement, to give expression to the phases of transformation from humiliation to egalization, as another way of "knowing" what it is our left-hemisphere's are working so hard on to represent in our writings. The experiences of being in humiliation, or of inflicting it. Of defending against it. Of getting angry or remorseful and deciding to change things. Of coming out of humiliation and its web of experiences into egalization and appreciation, mutuality, trust, safety, and so on. I think it's an interesting fantasy that might not be best realized in its original form. Maybe this is what you've been aiming for with the art-related part of the website? I wanted to pass this along to germinate, whatever it might grow into along the way! I support the idea of connecting the theory with practical application, and urge us to think about how what we’re researching and writing about can be applied in real world settings. It could be helpful for us to choose one or a few real world situations that are relevant for people’s work (for example, the situation at Abu Ghraib; or on-going problems of humiliations occurring at national and international boundaries, i.e. airport and road checkpoints in all parts of the world, from the U.S., to Tibet/China, to Israel/Palestine; or workplace-based humiliation) and use the examples to ground our discussions about theory and research... It could also be useful to make distinctions between different types of humiliation, such as individual-level, collective-level, etc. or humiliation that occurs within different settings, such as workplace, international, etc., and to have break-out sessions that focus on those topics. - "Asymmetries in self-perceptions of being the humiliatee versus the humiliator"
- "Archetypal humiliation in literature: A survey of English literature teachers"
- "Constructing Narratives after Violent Conflict"
- "Theory, Method, and Practice of Humiliation Research"
- "Humiliation/Dignity in the Workplace"
- "Humiliation/Dignity in the Family"
- "Humiliation and Child Sexual Abuse"
- "Armed Conflict, Escalation and Humiliation"
- "How to Prepare 'Non-Psychologists' (Human Rights Defenders, Peace Keepers, etc.) for Dealing with the Trauma of Humiliation in Victims"
- "Interlinking Peace Education and Humiliation Studies: A Bridge for Crossing Borders"
Now a lot of us are preachers, and all of us have moral convictions and concerns, and so often have problems with power. There is nothing wrong with power if power is used correctly. You see, what happened is that some of our philosophers got off base. And one of the great problems of history is that the concepts of love and power have usually been contrasted as opposites - polar opposites - so that love is identified with a resignation of power, and power with a denial of love. ..... What is needed is a realization that power without love is reckless and abusive, and love without power is sentimental and anemic. Power at its best is love implementing the demands of justice, and justice at its best is power correcting everything that stands against love. - A Testament of Hope: The Essential Writings and Speeches of Martin Luther King Jr., edited by James M. Washington. This quote comes from Martin Luther King Jr. 1967, SCLC presidential address. - This quote was kindly provided to us by Linda Hartling. For me, rather than thinking of human dignity as an individual, internal phenomena, I like to think of human dignity as a co-created experience. It is a experience developed through respectful connection (interpersonal, social, international, etc.) in which people feel known and valued, they feel that they matter... It is our responsibility to participate in the construction of this relational experience for all people. - These are reflections sent to us by Linda Hartling on October 11, 2006. • A light tone or a joke may sometimes break a nervous atmosphere. HumanDHS organizes two annual conferences, one outside of the U.S., and the other one within the U.S. (so far always at Columbia University in New York City). • Participants are encouraged to find their own sources of funding or economic support to participate in our conferences. Please inquire in your country and your university about possibilities. See, among others, for the US, www.supportcenter.org and www.foundationscenter.org. • For our NY workshop: The Weinstein International Fellowship program, inaugurated in 2008, provides opportunities for individuals from outside the United States to visit the U.S. to learn more about dispute resolution processes and practices and to pursue a project of their own design that serves to advance the resolution of disputes in their home countries. 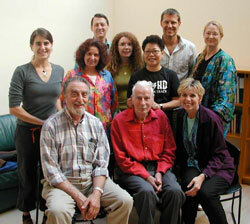 First Annual Round Table of Human Dignity and Humiliation Studies at Columbia University in New York City in 2003, convened by Morton Deutsch, with Michelle Fine, Susan Opotow, Beth Fisher-Yoshida, Janet Gerson, Andrea Bartoli, and Peter T. Coleman as participants. 2nd Annual Conference of Human Dignity and Humiliation Studies in Paris in 2003, convened by Evelin Lindner. 3rd Annual Conference of Human Dignity and Humiliation Studies in Paris in 2004, convened by Evelin Lindner at the Maison des Sciences de l'Homme in Paris. The third day of this conference, the 18th of September, represents the first of our film days, where Dharm Bhawuk shows films of our World Films for Equal Dignity project. 5th Annual Conference of Human Dignity and Humiliation Studies in Berlin in 2005, "Beyond Humiliation: Encouraging Human Dignity in the Lives and Work of All People," convened and organised by Eric van Grasdorff and Evelin Lindner. 7th Annual Conference of Human Dignity and Humiliation Studies in San Jose, Costa Rica, in 2006, convened and organised by Victoria C. Fontan, Christopher Santee, Linda Hartling and Evelin Lindner. 9th Annual Conference of Human Dignity and Humiliation Studies in Hangzhou, China, in 2007, convened and organised by Professor Shi-xu, Linda Hartling and Evelin Lindner. 11th Annual Conference of Human Dignity and Humiliation Studies in Oslo, Norway, in 2008, convened and organised by Professors Oddbjørn Fure and Kjell Skyllstad, and by Linda Hartling and Evelin Lindner. 13th Annual Conference of Human Dignity and Humiliation Studies in Honolulu, Hawaii, in 2009, convened and organized by Dharm P. S. Bhawuk, Professor of Management and Culture and Community Psychology College of Business Administration, University of Hawaii at Manoa, Honolulu, and by Linda Hartling, and Evelin Lindner, as part of the 6th biennial conference of International Academy of Intercultural Research, with the theme "World Peace through Intercultural Understanding."  Since our Paris Conference in 2003, Eric Van Grasdorff urges us to have a HumanDHS conference in Africa, and he suggests Cameroon, where he has one of his anchoring points. In our 2008 Workshop on Humiliation and Violent Conflict in New York City, Adenrele Awotona strongly supported this suggestion. 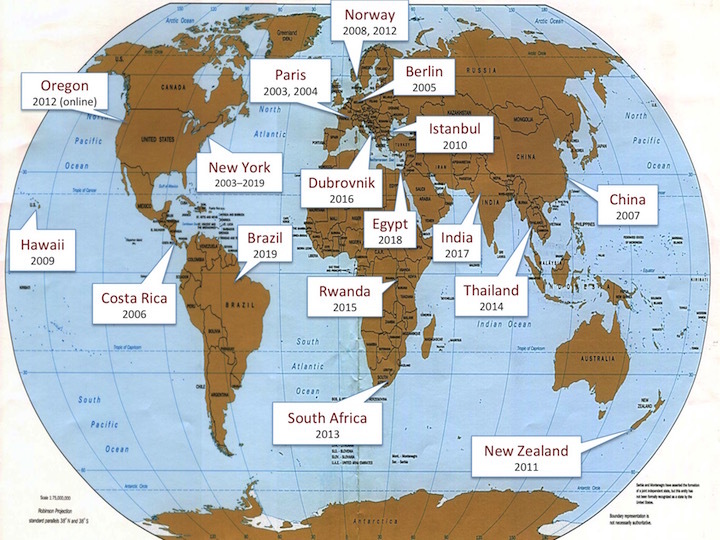  Since our Berlin Conference in 2005, also Emmanuel Ndahimana urges us to have a HumanDHS conference in Africa, and he suggests Rwanda, where he lives. We had the privilege of accepting his offer for 2015.  Neil Ryan Walsh would like to organize a HumanDHS conference in Japan, either as a global or local meeting.  Floyd Rudmin kindly suggests to organize a HumanDHS conference in Kingston, Ontario, Canada, or Montreal, at some point!  In 2007, during Evelin Lindner's stay in Alexandria, Egypt, the idea was aired that Ambassador Aly Maher El Sayed, advisor to the Bibliotheca Alexandrina, would be a great host for a future annual conference at the Bibliotheca Alexandrina.  At our 2007 Workshop on Humiliation and Violent Conflict in New York City , Arie Nadler and Yoav Peck aired the idea to organize a HumanDHS Conference on Humiliation in Jerusalem.  At our 2007 Workshop on Humiliation and Violent Conflict in New York City , Maggie O'Neill aired the idea to organize a HumanDHS Conference on Humiliation in the UK. Also Zinthiya Ganeshpanchan suggests to have one of our Annual connference in the UK, perhaps 2011.  At our 2007 Workshop on Humiliation and Violent Conflict in New York City , Florina Benoit added to the call of our Indian members, to organize a HumanDHS Conference on Humiliation in India. Also Rina Kashyap kindly offers to host one of our future conferences in New Delhi. And what about Indore with Deepak Tripathi!?  Alain d'Iribarne, Administrator of the Fondation Maison des Sciences de l'Homme, FMSH, kindly suggests (21st April 2008) that we have our 10th anniversary conference in 2013 again at the Maison des Sciences de l'Homme in Paris! Thank you, dear Alain!  Debidatta Aurobinda Mahapatra and Seema Shekhawat kindly envisage organizing a HumanDHS Conference in Mumbai. Chipamong Chowdhury (family name), or Bhante Revata (monk's name, known in the monastic communities), in our 2008 Workshop on Humiliation and Violent Conflict in New York City , also suggests Sri Lanka and Bangladesh.  At some point, our conference will have to take place also in South America. It would be wonderful if Howard Richards could organize a HumanDHS conference there.  Emanuela Del Re suggests that we have a conference in Rome.  Evelin would like to have one of our conferences in Bhutan, however, this might be too costly to travel to for most members.  In our 2008 Workshop on Humiliation and Violent Conflict in New York City , Philip Brown spoke about an alternative meeting place in Long Island.  Ardian Adžanela suggests that we have a conference in Sarajevo. He kindly writes (17th December 2008): "I believe the concept of sustainable Human Dignity in Human communication and social interaction is ( or at least should be) of special importance to transitional societies like Bosnia and Herzegovina, which has not been a war country for almost two decades now, but still faces some side-affects of the war."  Pandora Hopkins kindly suggests (on June 4, 2009) that we organize one of our conferences in La Paz in Mexico at some point.  In our Hawaii Conference in 2009, Uichol Kim kindly suggests (on August 21, 2009) that we organize one of our conferences in Yogjakarta, Indonesia, at some point.  In our Hawaii Conference in 2009, Victoria C. Fontan kindly suggests (on August 23, 2009) that we organize one of our conferences in Hargeisa, Somaliland, at some point, with the help of dear Edna Adan.  Kevin Paul Clements kindly suggests (on 1st September 2009) that we have one of our conferences in Dunedin, New Zealand, at some point.  Linda M. Hartling kindly suggests (on 6th October 2009) that we have one of our conferences in Nepal, with the help of her dear friend Krishna. On 10th October 2012, also Chandra Prasad Siwakoti is calling on us to have one of our annual conference in Nepal. He informs us of a new report by the UN Human Rights Office and writes: "Large numbers of people are feeling and suffering humiliation from both sides (Maoist and Government). An annual conference of our HumanDHS network in the South Asian region would be a millstone for the entire world community. Therefore, I would like to humbly request to YOU EVELIN , LINDA, and the organizing committee, to organize one of the future annual conferences in Nepal. This is a time to be unified against human rights violators, a time for protection and respecting human rights and human dignity in the world."  Theary Seng kindly suggests Cambodia as a conference venue, and her CIVICUS: Center for Cambodian Civic Education as host (January 2011).  Kjell Skyllstad encourages us to consider the Earthrights Foundation in Chiang Mai in North Thailand as a possible host for one of our future conferences (November 27, 2010).  James Darbouze kindly suggests to have one of our future conferences in Haiti.  Carol Smaldino kindly suggests Italy.  Ya'ir Ronen kindly suggets Beer Sheva, Israel, after our 2011 Workshop on Transforming Humiliation and Violent Conflict in New York City.  Waheed Ahmad, Advocate High Court, Secretary of the Interfaith Harmony Committee of the Lahore High Court Bar Association, Coordinator of the Juvenile and Minority Cell of Punjab Bar Council, Secretary of the Human Rights Watch Committee of the Lahore High Court Bar Association (2011-12), Secretary of the Human Rights Committee Lahore High Court Bar Association (2009-11), Legal Aid Commissioner for the International Criminal Court (ICC, 2010-2013), Former Deputy Director of Human Rights and Protection of Lawyers at the Union Internationale des Avocats (International Association of Lawyers, UIA), kindly suggested on October 2, 2013: "You people are always welcome to arrange your next Human Rights Event in Lahore, and I assure you my full cooperation in this regard."  Dr. Catherine Chua Siew Khenge kindly suggested on June 20, 2015, to hold one of our conferences in Singapore! Thank you, dear Catherine. And thank you, Francisco Gomes de Matos, for connecting us all!  Mark R.M.Itallange, after having participated in our 2015 conference in Rwanda, expresses enthusiastic interest to have one of our future conferences in his country Tanzania. • Siraj Khan suggests Dubai, where he is based, to be the venue of one of our future conferences. Thank you, dear Siraj! • Francisco Cardoso kindly suggests the University of Trás-os-Montes e Alto Douro (UTAD) in Portugal. • We very much thank Margret Rueffler for suggesting her wonderful Organic Garden and Retreat Center Jiwa Damai in Bali as a future venue for one of our dignity conferences! Alan Klein kindly wrote, 31st October 2005: One of the key elements in making an OS event successful is the focusing of the question that the participants respond to. Another is being clear about what will be done with the information presented and/or decisions made in the OS event itself. This conference comes at a time when I am reading The Art of Not Being Governed: An Anarchist History of Upland Southeast Asia by James C. Scott. In it he paints a picture of lowland civilizations/states developing in interaction with peoples living in the mountains and fleeing the states into the mountains, organizing their lives in such a way as to be beyond the power of the lowland states to incorporate them. He views this as a worldwide phenomenon, a dialectic of civilizations/states and places in which those who want no part of that enterprise preserve their own lives by living in the mountains, in the marshes, in a variety of "difficult" geographies that in the past made them beyond the reach of the states. Yet now, today, the "modern" states and corporations press everywhere to finish off the job of making everyone and every place part of their controlled domain.